Kelloggs K-Pride Affinity Group members who received the Retail Award. Photography by Terry Johnston Photography. Visit his facebook page for event photos. KALAMAZOO — Those who work towards LGBT support and equality were recognized by The Kalamazoo Gay Lesbian Resource Center with the annual REACH Awards at the Winter Gala on Feb. 1. The event also helped raise money for the community center and its programs. 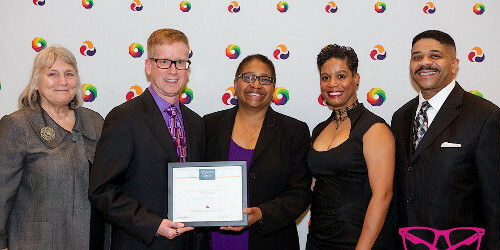 Kellogg’s K-Pride Affinity Group earned the 2013 Retail Award for their commitment to workplace diversity and inclusion. Kellogg’s belief that, “goodness shines from the inside out,” is apparent with their thirteen permanent Diversity and Inclusion Councils. Each Council works to engage employees with one another, Kellogg, and the communities in which they operate. Kellogg has also scored 100 percent on the Human Rights Campaign’s Corporate Equality Index for four years running. The Terry Kuseske Education Award went to long-time GSA advisor and educator at Kalamazoo Central High School Patricia Carlin. She has created a safe and inclusive space for all of her students during her tenure at Kalamazoo Central. Carlin is a tireless advocate and ally to all students, with a focus on LGBT youth who have needed safe adults on their side. Jon Hoadley was honored with the Advocacy Award. His leadership with the Unity Michigan Coalition has helped to bring protections in housing, public accommodations, and employment for more than 344,000 Michigan residents. Hoadley also managed the One Kalamazoo campaign to defend the Kalamazoo Non-Discrimination Ordinance. As a result of that victory he regularly consults on nondiscrimination campaigns across the country. Previously, Hoadley served as executive director of the National Stonewall Democrats, worked for the Gill Action Fund, and managed South Dakotans Against Discrimination. In the Kalamazoo community, Hoadley serves as the vice president of CARES, an HIV/AIDS Service Organization serving southwest Michigan. The Community Award was presented to Charley Bowers. She was recognized for her advocacy on behalf of Michigan’s transgender community. By sharing her personal story and struggle, Bowers has worked to improve awareness and understanding across the state. Her advocacy has had a particular focus on engaging young people and challenging LGBT-serving organizations to be more trans-inclusive. Bowers serves on the board of directors of Holland Is Ready and is a long-time volunteer with the Kalamazoo Gay Lesbian Resource Center. The Jim Knox Humanitarian Award went to David Feaster whose advocacy in the HIV/AIDS community began during his studies at Rutgers University where he was president of the Rutgers University Gay Alliance. Now the current executive director of CARES, Feaster joined as a board member in 1998 and began as a staff member in 2001. He is also a founding and steering committee member of Kalamazoo Alliance for Equality. Feaster’s commitment to improving the lives of individuals living with HIV/AIDS by decreasing stigma and improving care to communities of color has greatly increased the impact of this work. Rev. Beth McLaren earned the Faith Award for her advocacy on behalf of the LGBT community. McLaren has served as a strong voice as a member of the KGLRC Board of Directors, the KGLRC Faith Alliance, and a member of the clergy to advance conversations about fairness, equality and justice. She has been an ordained Episcopal priest for over 20 years, serving both in Michigan and in Connecticut. She has been an active participant in the Episcopal Diocese of Western Michigan having served on the Christian Formation Task Force, the Anti-Racism Task Force, and the Cathedral Corporation. For more than twenty years the Kalamazoo Gay Lesbian Resource Center has sought to serve the gay, lesbian, bisexual, transgender, and allied community of southwest Michigan. For more information visit http://www.kglrc.org.